Don't fall into your future... find it here! 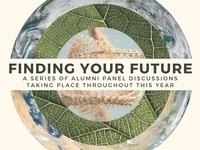 Meet alumni working in roles and organizations focused on the environment and energy creation. See the breadth of opportunity that is available to students who are interested in working on environmental issues or are pursuing a career in the energy sector. Learn what is required to enter into these highly-competitive industries and what you can do now to prepare for a future internship or early career position. Gain valuable insight from engaging Whitties working in the field! FYF | Environment & Energy -- 11 a.m. - 12 p.m.
FYF | Science & Engineering -- 12 p.m. - 1 p.m.
FYF | Healthcare -- 1 p.m. - 2 p.m.
Brunch will be provided for students who attend.